Safety 1st Oven Lock | White | Keep little ones safe from kitchen accidents with this oven front lock. Keep your little ones safe from kitchen accidents with this oven front lock. 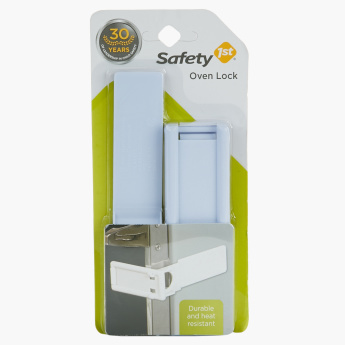 This lock helps to keep the oven door securely closed, It features a special heat-resistant latch that mounts it to the front of a stove. Feature 1 : Keep little ones safe from kitchen accidents with this oven front lock. Feature 3 : It can be used on ovens that are flush to kitchen cabinets. 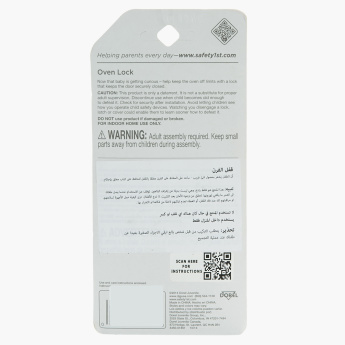 Feature 2 : It features a special heat-resistant latch and adhesive that mounts it to the front of a stove.